The death of the Egyptians upon the seashore is a glaring symbol of the ultimate doom of evil in its struggle with good. There is something in the very nature of the universe which is on the side of Israel in its struggle with every Egypt. There is something in the very nature of the universe which ultimately comes to the aid of goodness in its perennial struggle with evil. …Gradually we have seen the forces of freedom and justice emerge victoriously out of some Red Sea, only to look back and see the forces of oppression and colonialism dead upon the seashore. There are approximately 2,400,000,000 people in the world today. The vast majority of these people are found in Africa and Asia. More than 1,400,000,000 of the peoples of the world are found on these two continents. Fifty years ago most of these people were dominated politically, exploited economically, segregated and humiliated by some foreign power…What we are seeing now in this struggle is the gradual victory of the forces of freedom and justice. The Red Sea has opened, and today most of these exploited masses have won their freedom from the Egypt of colonialism and are now free to move toward the promised land of economic security and cultural development. As they look back, they clearly see the evils of colonialism and imperialism dead upon the seashore. No-one can honestly read this as a statement on modern Israel’s relations with Nasser’s Egyptian Republic. …[O]ut of all his knowledge of the Middle East, [Anthony Eden] decided to rise up and march his armies with the forces of Israel and France into Egypt. And there they confronted their doom, because they were revolting against world opinion. Egypt, a little country. Egypt, a country with no military power. They could have easily defeated Egypt. But they did not realize that they were fighting more than Egypt. They were attackng world opinion, they were fighting the whole Asian-African bloc, which is the bloc that now thinks and moves and determines the course of the history of the world. I suppose we should be grateful that the Jerusalem Connection at least managed to avoid citing the hoax “Letter to an Anti-Zionist Friend“. UPDATE: It seems that the decontextualised use of the King quote dates back to this 1998 article by Rabbi Marc Schneier, and it was reused by him recently here. Back in July I wrote a blog entry entitled “Walid Shoebat: The Simon Altaf Connection“, in which I explored Shoebat’s erstwhile British co-author from several years ago, Simon Altaf (also known as Muhammad Altaf). 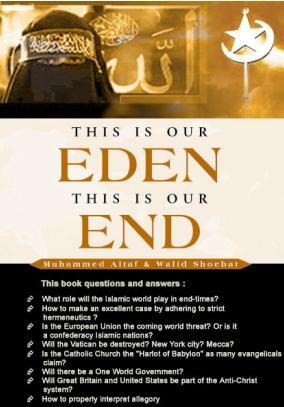 Shoebat and Altaf wrote an apocalyptic book together, This is Our Eden, This is Our End, and they co-founded a website called Abrahamic Faith, which promoted a form of Messianic Judaism (i.e. Christianity with Jewish practices) and which used to carry pieces attacking Roman Catholicism and mainline Evangelicals such as Billy Graham. However, I noted that the two men fell out after a few years, apparently when Altaf decided to come out as a polygamist (since then, the Abrahamic Faith website has been updated to reflect this belief). By a remarkable concidence, just a few weeks after my blog entry Shoebat made a public statement denouncing Altaf – I blogged on this here. The German Christian is not named, but is obviously Hilmar Von Campe (whom I blogged here). This man may be a convert but is not a convert from terrorism or an ex-terrorist background. It is clear he embellished his testimony because he knew he was going to make money out of it. His actions speak louder than words. He was converted by his American Christian mother who told him about the saviour while she lived in Israel with the family. It was through her actions that Walid was converted but he would never admit that to you unless he repents of his past actions first. His late Muslim father who married a Christian woman the poor man died in a nursing home in California not so long ago. If he was so anti-Christian and anti-West then what was he doing marrying a Christian? Why did he go and live in the USA if he hated the West? Walid claims that he was brainwashed from childhood. Only foolish people can believe that a respectable Muslim family will allow their eight year old to be trained for jihad, this is pure fantasy and simply not true.Respectable Muslim parents want to make their children doctors and Engineers not terrorists. If you want truth then look at me I am an Engineer why not a terrorist like he claims? My respectable Muslim family did exactly what I stated. We have many engineers in our family but if you believe Walid they are all terrorists!!! We would say Walid’s parents the Muslim father and the Christian mother did a fairly good job because he became a programmer for a big sugar company in California. Walid was never brainwashed by his parents. He made up a nice tale. Once I asked Walid why didn’t you put more Bible prophecy in your book “Why I left Jihad” and less about yourself then he remarked “Ah people like to hear a sob story”. Altaf also makes claims about a disputed family inheritance, and that Shoebat has a Jewish ex-wife. There are other allegations of a personal nature which I won’t repeat here; apologies for the lack of direct link, too. I have absolutely no idea whether Altaf’s supposed revelations are true, and no endorsement should be inferred from the above. However, given Shoebat’s current prominence and the controversy over his views concerning Muslims and Palestinian society, the spat is clearly in the public interest.